When I entered the world J.T. Twerell created in Catch and Release, I encountered shifting viewpoints (alternating between first and third person) and even shifting fonts – not to mention that new chapters began toward the bottom of the page. Previous to the experience of reading Catch and Release, I would never have presumed a font switch would alter the mood, yet it did. I found myself reading along and, as soon as the font changed, the atmosphere seemed to become charged with something which hadn’t been there previously. I met J first, a little girl whose life forever changed when her father, who had been a cop, was killed. J’s life became a nightmare as one man after another entered her home until her mother was murdered. Determined to get justice on those who were responsible for stealing her childhood, J grew while being nurtured by a man, Bob, who was entangled in the Mafia. He taught her everything he knew but she decided to hang out on the right side of the law. Twenty years later, the story resumes when a fishing expedition introduced J to the man who just might change her life for good – Dr.Steve Sanders. However, the underworld was in pursuit of J. As a result, Steve’s life had forever changed before he left the fishing grounds. Pursued by people he (formerly) knew only existed by watching the news or reading the paper, Steve’s life turned into a living nightmare. Forced to take on a new identity and into a world he’d rather forget, Steve wished he could awaken from it all and return to his normal mundane existence – as long as he could take J with him. Catch and Release was a roller coaster ride, for sure – not so much because of the emotions connected to the characters (though they are poignant, for sure) – but because it was hard to determine what was real and what was purely fabrication. I can honestly say by reading this book I’ve witnessed the dead return to life – with no blood and gore involved. For the avid reader who likes a story in which the outcome is unpredictable, Catch and Release is sure to be a book to keep you up at night, long past the hour when you should have turned off the light. Purchase your copy today by clicking on the book cover. 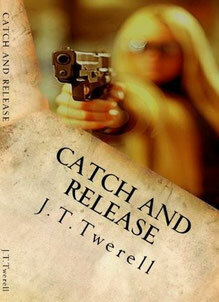 It will take you to Catch and Release's page on Amazon.